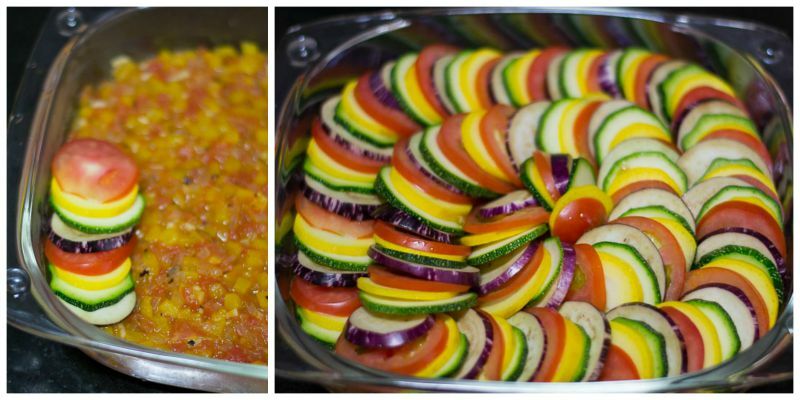 Recipe for “Ratatouille a la Remy” , inspired from the movie Ratatouille. Thomas Kellers Confit Byaldi. Ratatouille is one of the best food related movies ever made. Even though the movie Ratatouille released long back, my young son saw this movie for the first time recently. He loved it. He wanted to have the exact same Ratatouille that the rat cooked in the movie. How could I say no. I cook a very rustic “Julia Child’s Ratatouille” that does not look anything like how they show in the movie. I learnt that it was renowned Chef Thomas Keller who actually created the recipe for the movie. 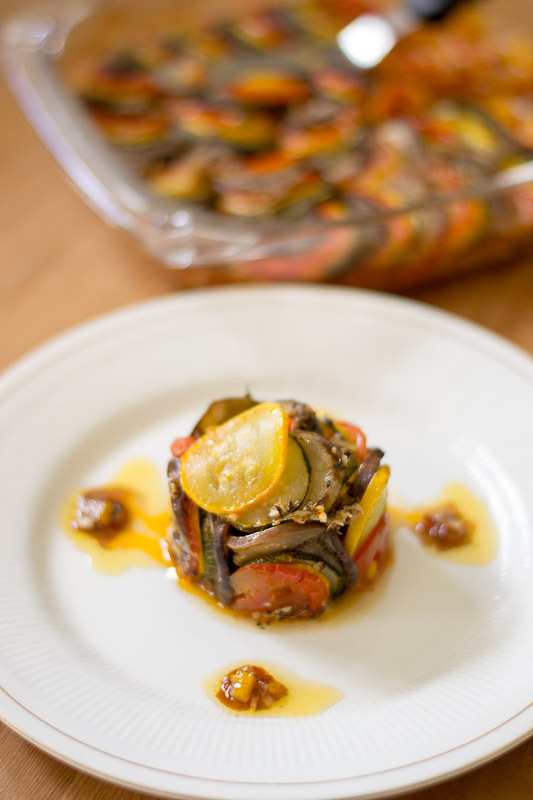 The dish Ratatouille shown in the movie is not actually a Ratatouille but a Confit byaldi. 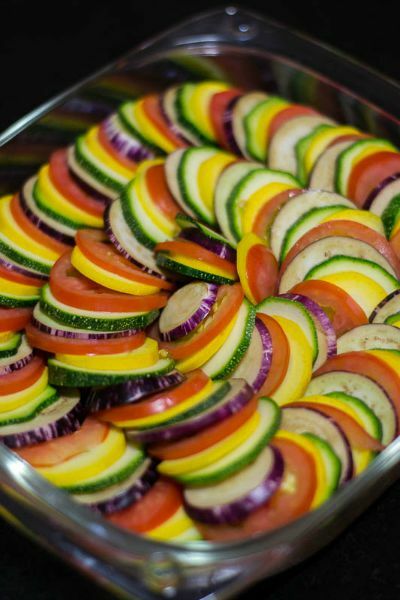 Confit byaldi is a variation on the traditional French dish Ratatouille. The founder of the great Napa valley restaurant French Laundry, Chef Thomas Keller mentored the Ratatouille film unit on what happens in the kitchen, how kitchens work, how the kitchens are setup etc… Technical information about how a kitchen was organized, the hierarchy, the restaurant and the different positions throughout the kitchen, what it looked like, what it felt like, the energy, how dynamic people work together and move around in the kitchen, Other things like recipes, how food should look when its plated, different cuts of vegetables and how it was sliced, placed etc… Thomas Keller says “the dance as we call it in our restaurant”. Producer Brad Lewis asked Keller how he would cook Ratatouille if the most famous food critic in the world were to visit his restaurant. 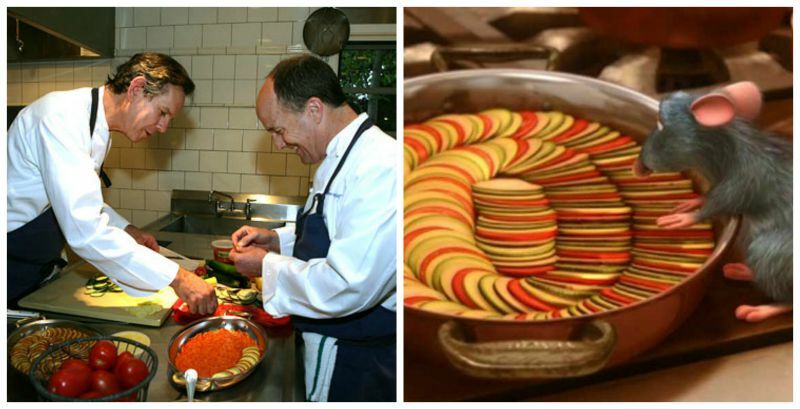 Keller decided he would make the Ratatouille in Confit Byaldi form, and fan the vegetable rounds accordion-style with a palette knife. Thats what you see in the movie too. Below is the picture where you can actually see Chef Thomas Keller making the dish for the movie. Now we know how much effort went on to make the movie. The dish turned out to be delicious. 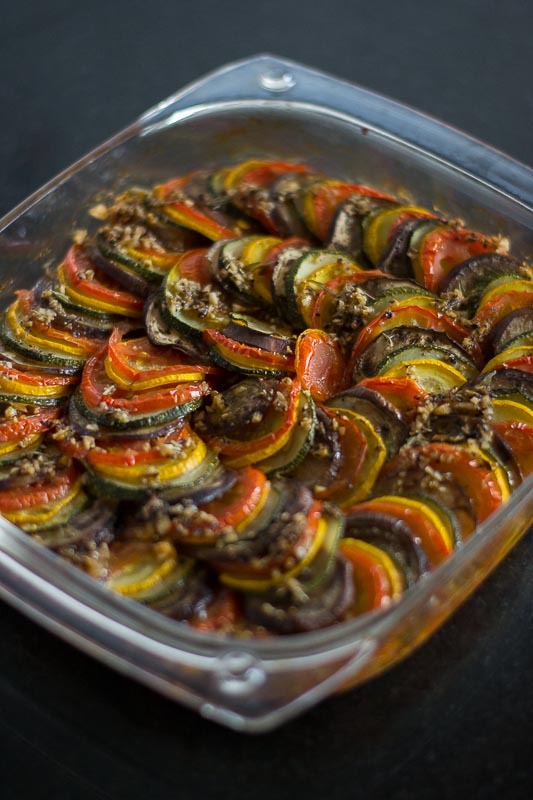 Here is the recipe for “Ratatouille a la Remy”, Thomas Keller’s Confit Byaldi. Recipe adapted from New York Times. First lets make the Piperade. We need to roast and remove the skin of the bell peppers. Oven method – Heat oven to 450 degrees Fahrenheit. Place pepper halves on a foil-lined sheet, cut side down. Roast until skin loosens, about 15 minutes. Remove from heat and let rest until cool enough to handle. Peel and chop finely. Now lets get the Tomatoes ready. Boil water in a pan and drop in the ripe tomatoes in boiling water. 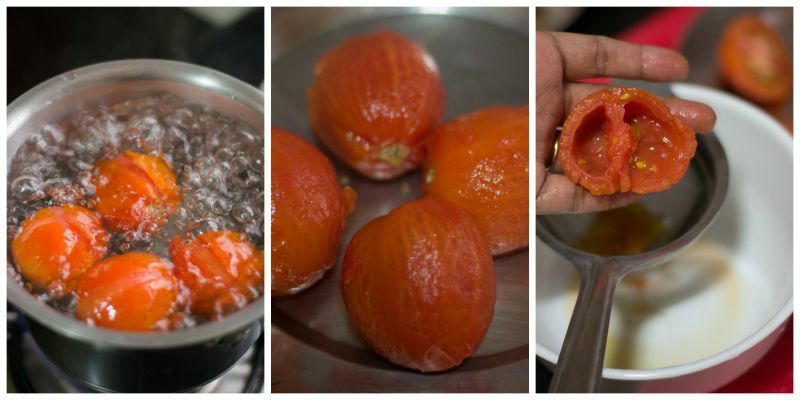 Boil for half a minute to a minute until the skin of the tomato cracks like the picture shown below. Peel the tomato skin and cut the tomato into half. Remove the seeds and let the juices through a strainer / colander. Reserve the juice. Chop the tomatoes finely. Set aside. 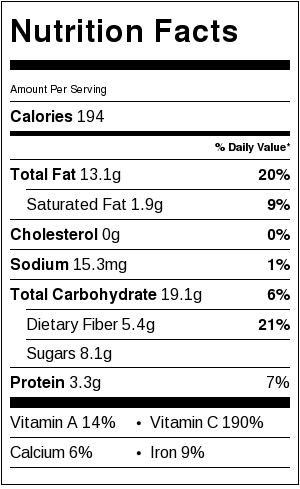 Combine oil, minced garlic, and onion in medium skillet over low heat until very soft but not browned, about 5 minutes. Add tomatoes, their juices, thyme, parsley, and bay leaf. I did not have fresh herbs. I used dry herbs. Use whatever you have in the kitchen. Simmer over low heat until very soft and very little liquid remains, about 8-10 minutes, do not brown; add peppers and simmer to soften them. Season to taste with salt, discard the bay leaf. Piperade is ready. Cut the veggies into thin slices. Reserve tablespoon of piperade mixture and spread remainder in bottom of an 8-inch skillet. For vegetables, heat oven to 350 degrees Fahrenheit. Arrange a strip of alternating slices of vegetables over piperade, overlapping so that 1/4 inch of each slice is exposed. Repeat until pan is filled; all vegetables may not be needed. Now breathe and feel like you are in Napa Valley’s French Laundry kitchen near Chef Thomas Keller. Mix garlic, oil, and thyme leaves in bowl and season with salt and pepper to taste. Sprinkle over vegetables. Cover pan with foil or parchment paper. For vinaigrette, combine reserved piperade, oil, vinegar, herbs, and salt and pepper to taste in a bowl. To serve, heat broiler and place byaldi underneath until lightly browned. Slice in quarters and very carefully lift onto plate with offset spatula. Turn spatula 90 degrees, guiding byaldi into fan shape. Drizzle vinaigrette around plate. Serve hot. 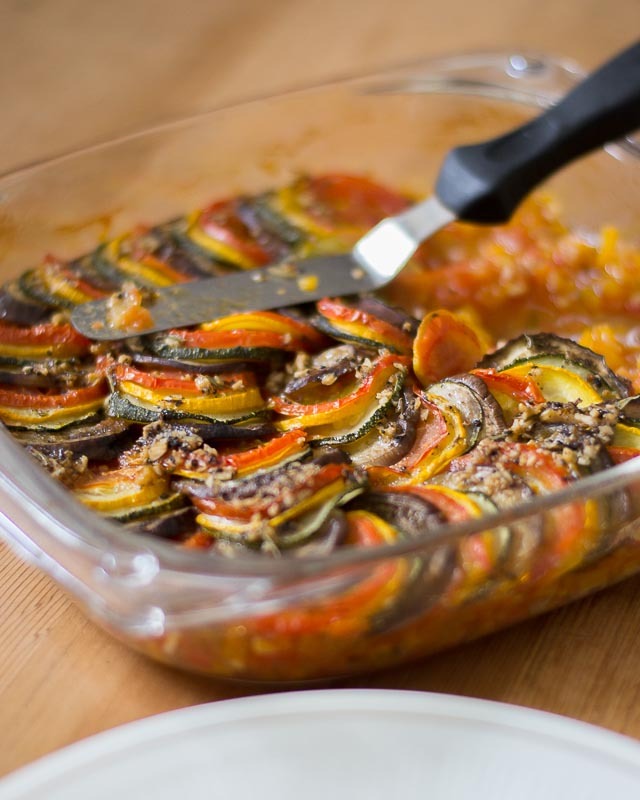 Recipe for "Ratatouille a la Remy" , inspired from the movie Ratatouille. Thomas Kellers Confit Byaldi. First lets make the Piperade. We need to roast and remove the skin of the bell peppers. 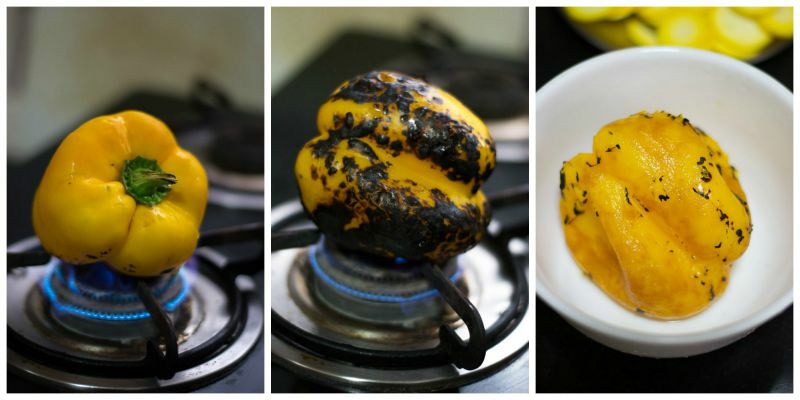 Stove top method – Roast the bell pepper directly on the gas stove burner for 3-4 minutes until completely charred. Remove the bell pepper and place it in a bowl and close it with a tight lid and allow it to rest for 5 minutes. The steam inside the bowl will release the charred skin from the bell pepper. Gently clean the bell pepper in running water and remove any hard charred skin with the help of your fingers. Repeat with other bell peppers. We will need only half of each bell pepper. Chop them. Set aside. Store the remaining bell pepper and use it in salads etc…Oven method – Heat oven to 450 degrees Fahrenheit. Place pepper halves on a foil-lined sheet, cut side down. Roast until skin loosens, about 15 minutes. Remove from heat and let rest until cool enough to handle. Peel and chop finely. Now lets get the Tomatoes ready. Boil water in a pan and drop in the ripe tomatoes in boiling water. Boil for half a minute to a minute until the skin of the tomato cracks like the picture shown below. Peel the tomato skin and cut the tomato into half. Remove the seeds and let the juices through a strainer / colander. Reserve the juice. Chop the tomatoes finely. Set aside. 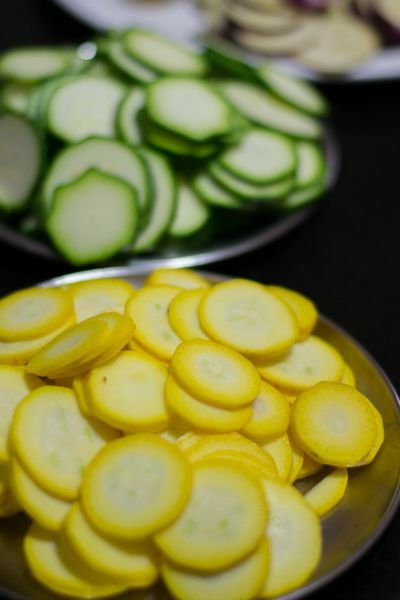 Cut the veggies into thin slices. Reserve tablespoon of piperade mixture and spread remainder in bottom of an 8-inch skillet. For vegetables, heat oven to 350 degrees Fahrenheit. 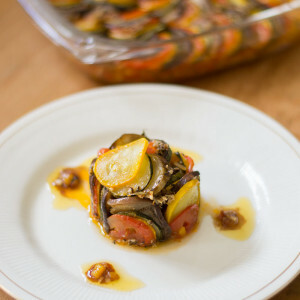 Arrange a strip of alternating slices of vegetables over piperade, overlapping so that ¼ inch of each slice is exposed. Repeat until pan is filled; all vegetables may not be needed. Now breathe and feel like you are in Napa Valley’s French Laundry kitchen near Chef Thomas Keller. Mix garlic, oil, and thyme leaves in bowl and season with salt and pepper to taste. Sprinkle over vegetables. 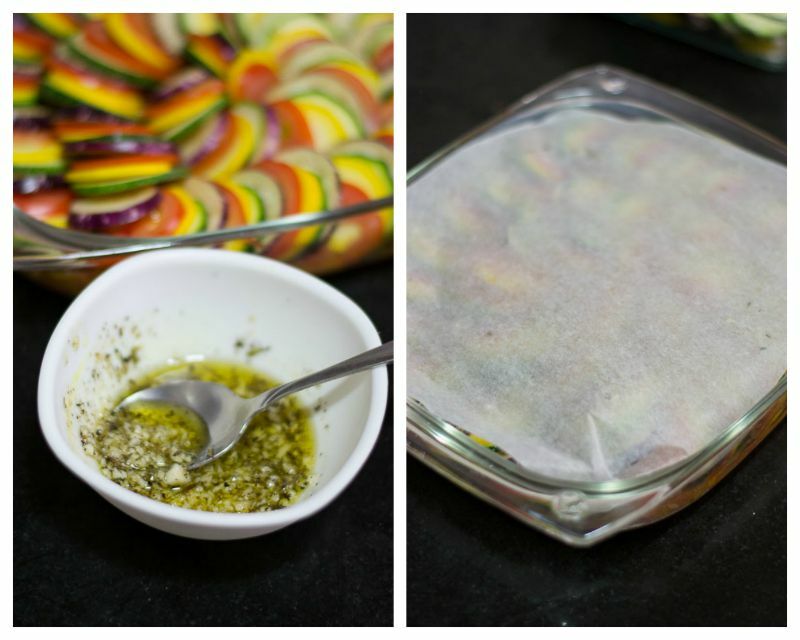 Cover pan with foil or parchment paper. 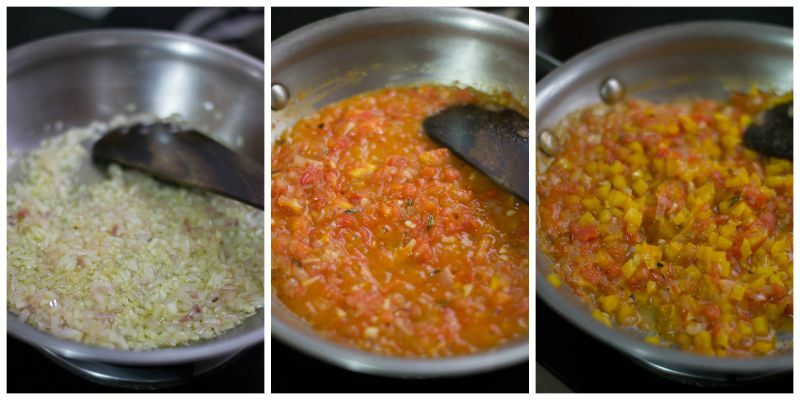 For vinaigrette, combine reserved piperade, oil, vinegar, herbs, and salt and pepper to taste in a bowl. To serve, heat broiler and place byaldi underneath until lightly browned. Slice in quarters and very carefully lift onto plate with offset spatula. Turn spatula 90 degrees, guiding byaldi into fan shape. Drizzle vinaigrette around plate. Kannamma, just came across your site today . Dhool !! Simply love the way you write your recipes nd the way you share the information . Nothing held back …you give it all . The way you write your recipes , makes a reader salivate Nd want to immediately try it . You make it sound simple , you make it sound doable , you make it sound so effortless. Pls keep them coming …more power to you . I have just come across your site and i have already bookmarked recipes to try. But this post stunned me.To do research and to make a dish as in a movie because your son asked for it, ma’m your efforts deserve a big salute. Thank you so much Karthika. Thank You so much Menaga. Thanks for sharing this recipe with us. I really love Thomas Keller’s passion for food and presentation and you totally nailed the presentation piece here. Until today I wasn’t brave enough to even attempt this recipe, but plan on giving it a shot, thanks to your ever simple steps in all your recipes. Also, you are a wonderful storyteller. The way you set this recipe up with the background of the movie and chef was amazing. I’m so at awe of your post… Ratatouille is a movie I’ve seen innumerable times.. And the way you have described the movie and what went on behind it was beautiful… Thank you!